A cartoon depiction of President Xi Jinping in an infographic, the first such image of him carried by a State-run media outlet, has triggered much discussion of the new attitude toward publicizing China's top leadership. The infographic, carried by qianlong.com, a news portal administered by the publicity department of the Beijing Municipal Committee of the Communist Party of China (CPC), summarized Xi's major steps since he took office as general secretary of the CPC Central Committee in November 2012. The infographic read that Xi has spent 39 days doing 12 inspections in 11 provincial regions, and spent another 39 days visiting 14 countries on five continents. The infographic also listed Xi's hobbies such as reading, soccer, swimming and martial arts using pictograms. 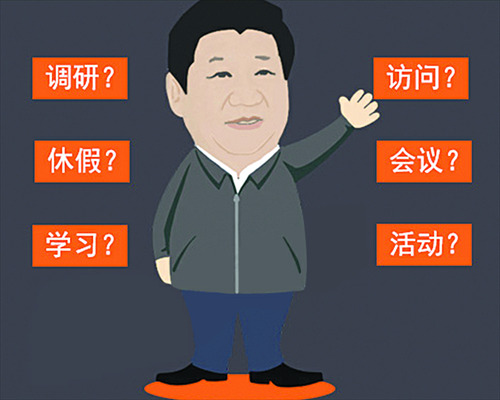 This marks the first time State-run media has published any type of cartoon image of Xi. Previously, a video titled "The makings of a Chinese leader" went viral online in October last year via popular video website Youku, in which China's top leadership was presented in animation. Observers view the infographic as a further step on from the video to demonstrate the renewed, modern political publicity concept of China's leadership. It values the building of a leader's personal image and public interaction in plain but striking ways. Although common overseas, it is extremely rare to see a cartoon of senior Chinese leaders, as the art form is considered to mainly bear a critical or satirical function to reveal social problems. In 1986, three cartoons attracted unprecedented attention at an exhibition in Shanghai. They depicted Deng Xiaoping playing bridge, Hu Yaobang, then Party chief, conducting a chorus, and Jiang Zemin, then Shanghai mayor, reading a book. "I drew it in sincere gratitude to Deng who made our lives better so my family could reunite after the Cultural Revolution (1966-76)," Zhang Weiping, one of the cartoonists, told the Global Times. Zhang spent a month creating the work and avoided the "fighting style" of Cultural Revolution cartoons. It was published in the Jiefang Daily on August 15, 1986 as a pioneering step. Zhang said the three cartoons garnered plaudits from the public, especially from factory workers, who said they felt that "the leaders are among us." Yet similar works rarely appeared for more than two decades as the top leadership decided it had to be "extremely cautious" with cartoons of leaders, Zhang learned later. The deadlock was not broken until September 2006, when a cartoon of former President Hu Jintao writing a letter appeared in the Guangzhou-based New Express newspaper. Beijing-based cartoonist Zhang Yanjun and Zhejiang-based artist Zhu Zizun also created some well-respected cartoons depicting leaders between 2009 and 2011. Although not widely spread, they still consider it a change that they were allowed to do so. Considering the subtle cultural and political conventions, "leaders cartoons" in China have little exaggeration and use positive topics, said Zhang Weiping. He called the infographic image a "proper one" that accurately shows Xi's features. Although without clear rules, media normally would not print cartoon images of officials above the ministerial level, a senior editor of the Beijing-based Cartoon Weekly told the Global Times. He noted that the atmosphere has become more open in recent years, not only because officials want to get closer to people, but it also indicates that the public has a deeper understanding of cartoons. "A good cartoon can tell a story or even beautify the subject; it has a much wider function than merely being satirical or amusing, as long as it shows the essence of the subject," he said. Xi has attracted much praise for being "a man of the people" after a surprise visit to a Beijing bun restaurant in December 2013 when he sat and ate with regular diners.